We’ve got a French two-for-one special going on today. We’re combining French language and art for a fantastic, in-context learning experience. And there’s perhaps no content more interesting than art for a lover of Paris, France and French! 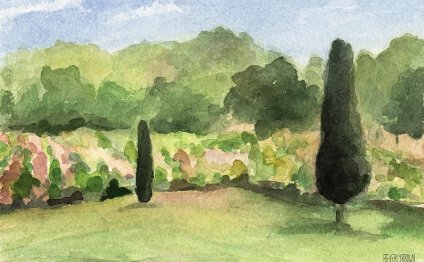 Words used to describe landscapes (paysages), colors and techniques will help you sound like the biggest art history buff around when discussing French art with your friends. You don’t need to visit Paris to discover these works of art, but once you’ve uncovered the keys to studying them—and speaking about them!—you just may want to plan a trip and see some of these works of art (œuvres d’art) for yourself! The Louvre museum boasts two great galleries of large format French paintings, one devoted to Neoclassicism (néoclassicisme) and the other to Romanticism (romantisme). La Liberté guidant le peuple (1830), or Liberty Leading the People, can be found in the latter wing. The famed painting by Eugène Delacroix is interesting for two separate reasons. The first has to do with French culture and history. The painting was created to commemorate the July Rebellion of 1830. Painted in the same year, it’s an important and intriguing testament to this rebellion which dethroned Charles X after the monarchy had been reinstated in France following the fall of Napoleon’s Empire. The painting represents an important and tumultuous part of French history, displaying several key figures, including, of course, Liberty—also the French figure of Marianne—in the center. But that’s not the only reason that the painting is so important. It’s also a key to understanding romantisme in the French art tradition. Romantisme was characterized by a freedom (liberté) of color, so it’s important to study the effect of color in this painting. Given the subject matter, it’s not surprising that the key colors of the painting are the blue, white and red (bleu, blanc, rouge) of the tricolor flag. Not only does Liberty carry the flag (porte le drapeau) displaying these colors, but they can also be found in the clothing of the man kneeling before her. This was included in the painting in case censors (la censure) forced the flag in the top portion of the painting to be cut out. But color isn’t the only important element of this painting. The structure and symbolism (symbolisme) are important to study as well. Liberty is depicted as a goddess, but also as Marianne, a woman of the people, even wearing the Phrygian cap that had become a symbol of the first French Revolution in 1989. Corpses (cadavres) form her pedestal and allow her to enter into the world of the viewer. J’adore le travail de couleur de Delacroix. — I love the way that Delacroix works with color. Brent Jensen Oil Painting Demonstration of "Autumn in France"